Hutchinson Island Florida Sea Glass? 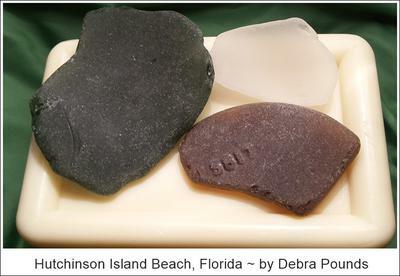 Does anyone know if there is sea glass found on Hutchinson Island Florida? 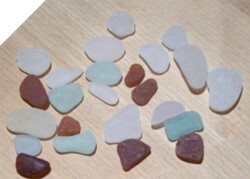 The sea glass in the photo above was found on Hutchison Island Beach, FL a few years ago. My sea glass collection along with memories of those days are very precious to me. PS - Thank you David and Lin for the newsletter. I found two pieces of sea glass near 51st St West in St Pete Beach Florida. Although they were not high quality, I was excited because I had just read. Name of Beach and Comments: Palm Coast FL~ Cinnamon Beach UNBELIEVABLE....found over 50 pieces in two days! Comments for Hutchinson Island Florida Sea Glass? I was walking along Hutchingson Island beach (around the Miramar condos) and found a rectangle piece!! I was so excited! It is probably a very common one, but still exciting. It was clear frosted and has a faint circle and embossed on it. 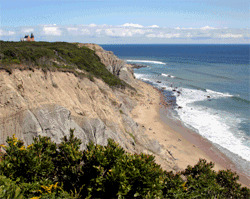 I went looking around bath tub beach about a month ago and didn't find much. Just 3 small brown pieces near the inlet.